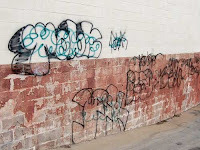 I borrowed this image from our anonymous friend over at the CMTRUTH blog, who has posted several excellent entries over the past couple weeks which illustrate the graffiti problem in Costa Mesa. Of course, the author has also included some interesting comments about one insidious rabble rouser here in town, too. I suggest that you take a few moments to jump over to that blog and scroll down through the entries. Second, there is an outstanding entry on the Newport Beach Voices blog by author David Bahnsen addressing the first couple weeks of the Obama presidency. You can read it HERE. Bahnsen provides us with yet another interesting perspective on how this regime is beginning to play out. I, for one, am extremely apprehensive about the way Barack Obama is beginning his presidency. As I've said before, this is no job for a trainee and that's exactly what he is. I've spent a lifetime assessing and selecting strong leaders, so I know just a little bit about the subject. Obama has no proven leadership experience and his first couple weeks in office demonstrate that deficiency. He's made abysmal choices for some key administration positions which demonstrates to the American people and foreign leaders that he is simply not ready for this job. This blog is not aimed at national issues, but that's my view on this one. During their Study Session next Tuesday, February 10th, the Costa Mesa City Council will discuss the mid-year budget analysis. In years past this has been illuminating, but not earth-shaking. Not so this year. This year the council will hear from the Finance Department that our municipal fiscal San Andreas Fault is slip ping - and will continue to slip into the foreseeable future with no "Richter Scale" predictions possible at this time. The short version of what will be discussed is: because of the known shortfall in revenue from a couple very important sources - Transient Occupancy Tax and Sales Tax - the city must tap deeper into that magical pocket called "fund balance" to balance this year's budget. They had budgeted to spend $6.24 million in fund balance to make the numbers work this year. Now they must dig deeper into that pocket, bringing the total fund balance to just under $11 million. So, today I asked a member of the city staff just how deep that pocket really is? How much money do we have in the "fund balance"? The answer rocked me back until the details were explained. We currently have $66 million in the fund balance account. Following the proposed adjustment there will be $55 million. However, not all of that can be tapped. More than half of it is restricted to very specific uses, including $14+million for the emergency reserve which cannot be used for normal operations. Without boring you with the details, there will be approximately $10 million of usable fund balance left after this adjustment. These are scary times for all of us, but for municipalities in particular. For example, this year the revenue from the Transient Occupancy Tax (TOT) is down nearly 10%, but the last two months for which numbers are available show short falls of almost 14% and 18%! I cannot let this slide without observing that our City Council chose not to present an increase in the TOT to the voters in November. That bit of short-sightedness is coming back to bite us all in the backside now. We don't know what the shortfall in our Sales Tax revenue will be precisely, so our excellent finance folks are using 10% as a number until the actual decrease is known, probably in March. Another shoe waiting to drop on this financial centipede is the question of how much the state is going to squeeze the cities as our legislators practice malfeasance with the state budget. And, then there's the federal stimulus package - the impact of which is unknown locally. We also don't know the impact of any cuts the various departments will be making to their expenditures will have on our budget. The numbers that will be presented to the council Tuesday do not reflect any cuts yet. So, dear friends and neighbors, it's time to take a deep breath and hope our city council has the wisdom to listen to it's staff on this issue. That's what I'm going to do and hope I don't end up looking like a Smurf next week. I do know this, though. This year we are pulling more fund balance money from that special pocket to balance our budget. We will have only $10 million left - which will very likely not leave enough to work that magic next year. If the economy continues on it's current path, our city leaders and staff face some very, very difficult decisions ahead. Let's hope they are up to it. 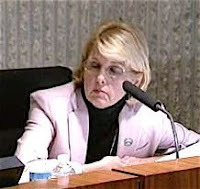 The drama goes on regarding the establishment of ad hoc committee - a "task force" to sort out issues regarding the Costa Mesa Senior Center prior to the renewal of it's contract this summer. At their meeting last night, the Costa Mesa City Council addressed Gary Monahan's proposal fo r the establishment of the committee in it's latest permutation. Monahan has been trying to broker an acceptable arrangement with the Senior Corporation Board that also would pass muster with the City Council. His latest idea is that the ad hoc committee would have two members each from the City Council and the Senior Corporation Board. That quartet would then select the remaining community members with the exception of the representative chosen by the Chamber of Commerce. This keeps the City Council from stacking the deck with outspoken malcontents - something Wendy Leece wanted to do. "I have a concern that, ah, you know, ah, just as far as objectivity as far as the selection. We would only have two city council members on this task force. I just have a problem thinking that there are more members that apply, just really being fair in selecting the final task force. The way you presented it to us we were going to select the members and now that's kinda being taken away and I'm concerned that we lose that ability to place the people on who would, I feel, really represent the interests of the city." "Expanding the numbers and then, uh, that kinda takes that out of the control of the city then. Because you got, er, you had a definite number of members, but if we grow the committee then we may lose our influence." Well, duh, Wendy! And why, specifically, should the city have "control" of an issue involving a private corporation? The city provides the building and some cash, but the volunteers on the board and the staff of the Senior Center do ALL the work. You're not losing "influence" - the game will just be played with fair rules for a change. Clearly, Leece doesn't like having to work with a level playing field. That's understandable, since she had been part of the "improver" majority during her entire tenure on the council. If this proposal flies there is a chance that the whole non-issue that Leece ginned up will receive something approaching a fair hearing. The four members of the council who could vote on this issue - Katrina Foley had to abstain and was not on the dais for the deliberations because of a business conflict - chose our young jailer/mayor Allan Mansoor and Monahan to be the council committee members. It's not clear what role, if any, Wendy Leece will play in this scenario. She's the city council liaison to the Senior Center, but that doesn't necessarily entitle her to participate in this ad hoc committee. The council also decided to re-advertise the application process and provide applications at the Senior Center to facilitate interested seniors being able to more easily participate in this process. Eric Bever expressed some concern that those folks who had already applied might be put off when they find out that a balanced committee will decide the selections instead of the council using their power to appoint members. Now the Senior Corporation Board will, at their meeting on February 17th, consider this issue again and, perhaps, chose two members to be on the committee. It's still not clear that the Senior Corporation Board is actually willing to participate in this dog and pony show. We'll see how this shakes out now. 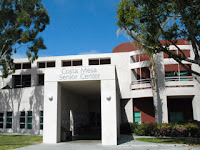 Tonight the Costa Mesa City Council will, once again, address Gary Monahan's proposal of an ad hoc committee to review operations of the Costa Mesa Senior Center preparatory to the renewal of it's contract with the city later this year. And, of course, this issue is the final item on the agenda tonight. Under normal circumstances, this would mean that most seniors wouldn't be able to stay up to attend the meeting nor watch it on Costa Mesa TV, Channel 24. Tonight might be different because the agenda appears to be short.. we'll see. Theoretically, the appointments to the committee will be made at this meeting, although I understand the Senior Center Board has requested a continuance to a future date. I don't know if that will fly, since there seems to have been plenty of time to get their ducks in order on this issue. WENDY'S WITCH HUNT, PART TWO? As I've stated before, I really hope this doesn't turn out to be a continuation of Wendy Leece's witch hunt at the Senior Center. Leece, who lacks the judgment one hopes for in an elected official, has allowed the unfounded complaints by a couple malcontents at the center to force a full-blown investigation into every nook and cranny of Senior Center operations. And that was before Monahan's proposal for the ad hoc committee. In addition, she has taken upon herself authority she doesn't have by permitting activities at the center that are well beyond her purview. This has caused no small degree of unrest among the staff members and members of the center. In my view, the Senior Corporation Board needs to take a much stronger stand on this issue. It's clear from documents presented recently that they provide a much higher level of service to our seniors than ANY other such facility around - including those operated by the municipalities themselves. They've made the financial documents available for review and, to my knowledge, no irregularities have been identified. If the vindictive and short-sighted nitwits of the City Council majority think they can do a better job of running the Senior Center in these very difficult fiscal times, perhaps the Board should just step back and let them try it. In my opinion, the seniors of this city are getting much more bang for our buck than would be the case if the city were to take it over... but that's just my opinion. SCHOOL RESOURCE OFFICERS TO DISAPPEAR? Rumor has it that the current financial crisis under which our municipalities and school districts are operating may cause funding for a couple School Resource Officers to disappear in June. That would be tragic. Based on many comments by folks in the know, the SROs perform an essential service in gang prevention and - more importantly - intervention. I certainly hope that these rumors are unfounded and, if they turn out to be true, that some way of continuing to fund these positions can be identified. COUNCIL MAJORITY DOESN'T GET IT! No one doubts that our community has a gang problem, but the current council majority has already made know their displeasure for any program that is one of intervention. The Neanderthal views of the majority seems to be that enforcement is the only program worth funding - contrary to the most authoritative information available that tells us intervention is critical to making any serious inroads into gangs in our city.